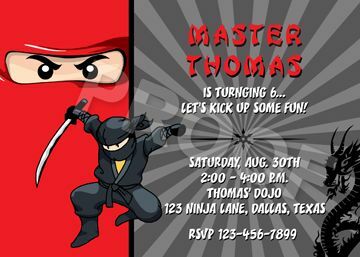 Since I have a little boy I thought it would be fun to create a Ninja birthday party collection, and no better place to start than a Ninja invite! This would be great for not only a ninja birthday party but also a Ninjago party if you have a child that loves Legos. Here is the first item in the collection. If you would like this invitation, matching party printables or custom items contact Paper Perfection at jtanddolly@yahoo.com for pricing and details.